This service automatically, starts immediately after ordering. The service of cheating the bot rating in the StoreBot.me bot catalog. The service is only suitable for bots, which are already added to this directory! This service automatically, starts immediately after ordering. The service of cheating channels rating in the Tchannels.me directory. The service is only suitable for channels that have already been added to this directory! 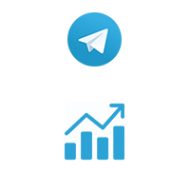 Telegram is a simple and convenient messager, which instantly synchronizes communication between all devices. The service is on the wave of popularity, both in the CIS and in English-speaking countries. The account is linked to a mobile phone number, in order to log in via a computer you just need to log in. You will be sent an SMS with a confirmation code. This program is a tool for unlimited and fast messaging. In conclusion, we would especially like to emphasize the feature that distinguishes Telegram among other messengers and that is confidentiality. If you don't want to save any messages with the contact, you can set them to self-destruct every 10 seconds. We recommend everyone to download Telegram for free. Rating is built in accordance with the average number of views of post on a Telegram channel. The analysis contains channels in the Russian language. The analysis includes posts, containing text content and published within the period of the research. The build-up of the rating excludes those channels that contained less than 10 posts. The rating calculation excludes posts, that contained reposts from other channels. The data on the quantity of views are valid by the time the rating is prepared. Smmlaboraroty is supposed to provide its service any hour of the day. We offer low prices, easy methods of payment and warranty to perform the order.